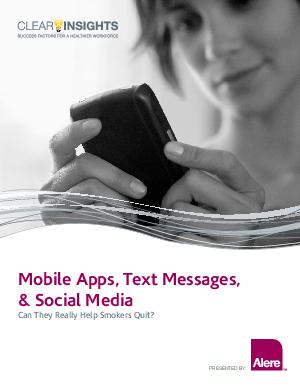 Home > Alere Wellbeing > Mobile & Social Technologies for Tobacco Cessation: Do They Work? Tobacco use remains the number one cause of preventable death and disease in the United States, and each smoker you employ costs an estimated $21 per day, or $7,874 per year in excess medical costs and lost productivity. Your organization may currently offer a tobacco cessation program, but if your employees are not using it, their chances of quitting are slim. The question remains - how do you get smokers to enroll and stay actively engaged in your tobacco cessation program, which will boost their chances of success and improve your ROI? In a day when 47% of adults use social media, 85% own cell phones, and 72% use their phones to send and receive text messages, the new frontier for driving engagement in behavior change programs may be mobile technology and social media. Not only are these platforms specifically designed to expand reach and engage users in a personalized way, they are utilized by populations which have been traditionally considered "hard to reach," such as minorities and youth. Read this white paper to learn how new technologies can effect real, measurable behavior change in the tobacco users at your organization - and save you from excess healthcare costs.